Author: Patent, Dorothy Hinshaw Set In . . . In 1804 Meriwether Lewis and William Clark were sent by President Thomas Jefferson to explore the largely uncharted western territory of North America, and thus became critical figures in America’s expansion and major contributors to its scientific scholarship. They observed and documented scores of animals, including the Great Plains wolf, mule deer, prairie dogs, grizzly bears, and salmon. Several species and subspecies of mammals, birds, and fish previously unknown to science were recorded for the first time; the information gathered would serve as the basis of scientific study for years to come. 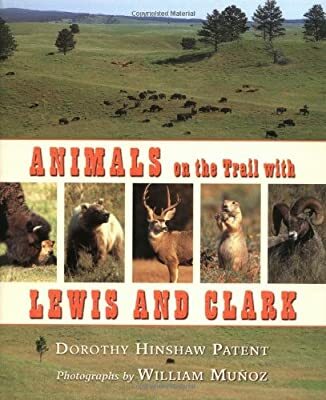 Collected here are stunning photographs by William Munoz that catalog the diverse array of wildlife witnessed by Lewis and Clark. Nature lovers and history buffs alike will be intrigued by this unusual account of the journey, whose bicentennial will soon be celebrated. Route maps, suggestions for further reading, chronology of animals sighted, index.